In Asgard we see the glittering halls of Valhalla, where the honored dead are taken by the Valkyries. As is his habit, Odin is in attendance, toasting the heroes, but he is apprehensive as he feels a great confrontation is approaching. The woman Saga brings him his refilled cup and she comments on Odin being distracted. He explains that he feels that the only remaining empty seat in the hall is about to be filled, but he doesn’t know precisely what that will lead to. In Manhattan, Thor is still on the destroyed construction site in his Sigurd Jarlson guise. He muses with Jerry, the foreman, about Thor being back in New York when he had moved to Chicago. They are interrupted by a worker who tells Sigurd that the lady he rescued is asking to see him. She is on a gurney, ready to be placed in the ambulance. They have a brief moment where she promises to repay him for her rescue. Sigurd leaves after the ambulance leaves and changes into Thor, ready to investigate the voice that he has now heard calling for him three times. Returning to the smith, we see him standing before a vast assemblage of beings and he calls for silence. Using the sword, which nears completion, he banishes the darkness that is hiding Hugin and Munin. He strikes at them, saying “Let this, then, be the first blow against the power of Asgard!” Yet again, “Doom!” rings out. On Earth, Thor has travelled all the way to Antarctica, where he finds a hidden valley, heated by volcanic vents, where there is an old Viking village among green fields. He investigates and, while there are no people in sight, there is a fresh, but cool, pot of soup. He continues on and finds a Viking grave yard, where all of the stone ships are pointing to a cave entrance. 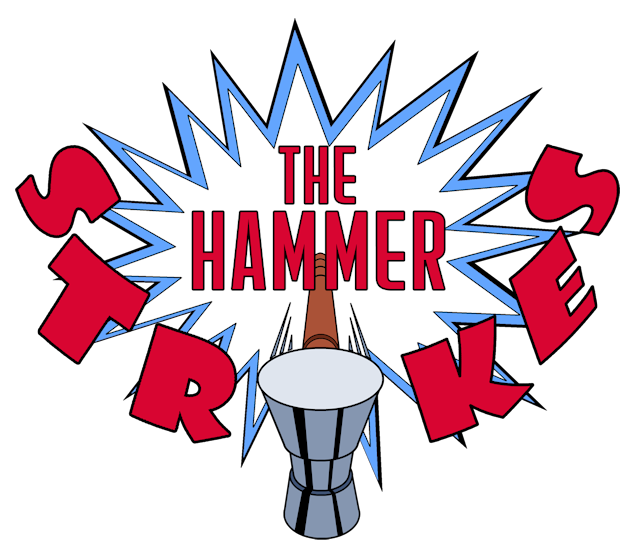 Thor enters and is immediately caught in a spear trap when a door slams shut behind him. In the woods of Nornheim, Balder has set up camp for the night when a stranger asks for hospitality. This stranger turns out to be Karnilla and she provides him with provisions as well as an offer to seek her out should he ever need a friend. Back in Antarctica, Thor avoids a series of traps and eventually meets an armored warrior. The foe throws his spear at Thor and misses. Thor takes him down with a single blow of Mjolnir and removes his helmet, and is shocked by what he finds. Thor has revealed an old man, Eilif the Lost, in the armor. After Thor carries Eilif out of the caves, we get the story of how he happened to be there. Eilif’s ancestors we part of King Harald Hardraada’s army, which invaded England in 1066. After their defeat, they fled in long ships, which were scattered by a storm. One ship managed to make it as far South as Antarctica, sailing into a fiord that ended in a cave, which led to the valley that Thor first arrived in. The ship was wrecked on a submerged rock and the survivors settled in the valley, building the village and turning the cave system into a training ground for warriors. Eilif was the last chieftain of the tribe and, now that he is old and alone, he wished to call on Thor and die in battle. He put Thor through the traps to enrage him so that he wouldn’t look too close at his opponent. Thor claims Eilif’s life as his own and refuses to let him into Valhalla by treachery. 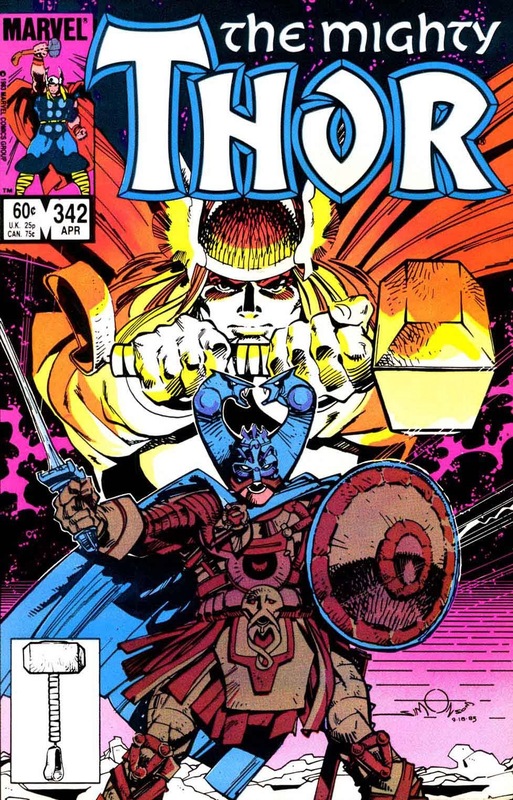 Where it comes from: I find it rather obvious from this issue that Mr. Simonson was (and possibly still is) unaware of Ásatrú, or Norse Paganism, which has been around in the United States since the 1970’s. 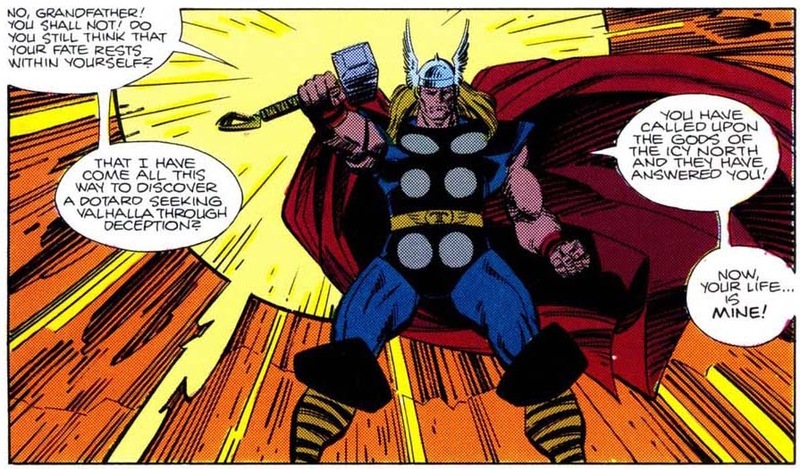 By placing Eilif in the role of “The Last Viking”, and by stating that Thor hasn’t heard this call in many years, it is implied that there are no worshipers of the Norse Gods in the Marvel Universe. I find that pretty hard to believe, since Thor and Hercules are obviously real in that universe, that there wouldn’t be any Pagan groups worshiping those Gods. Heck, Superman inspired a religion in DC, and he isn’t even a God. King Harald was the king of Norway for 20 years (1046 to 1066). He invaded England in 1066 in an attempt to take the throne from King Harold Godwinson in September of 1066, but was killed at the Battle of Stamford Bridge. After this victory, Harold Godwinson had to force march South to meet the forces of William of Normandy. Many attribute Harald Hardraada’s invasion with ensuring that the Norman invasion of England was a success. Harald did bring women and children along with his army, so Eilif’s ancestors could have made a life in that valley for 900+ years. The family tree, however, would have resembled a trunk and the amount of recessive genetic problems that would have resulted from so much inbreeding probably account for a single old man being the only survivor. I should point out that Valhalla is not the end-all, be-all of the Norse afterlife. Many Heathens, then and now, would not have died in battle and, therefore, not have had the opportunity to go to join the Einherjar. Most of the dead would simply journey to Hel and join their ancestors, where death continues pretty much how life did. In fact, the fighting all day and feasting all night aspect of Valhalla would seem to some, myself included, to be much less desirable than being reunited with their family and watching over their decendants. Next time the final fate of Eilif and Fafnir. A Joyous Yuletide to One and All!